The way calories in food is measured has not changed for over 100 years. 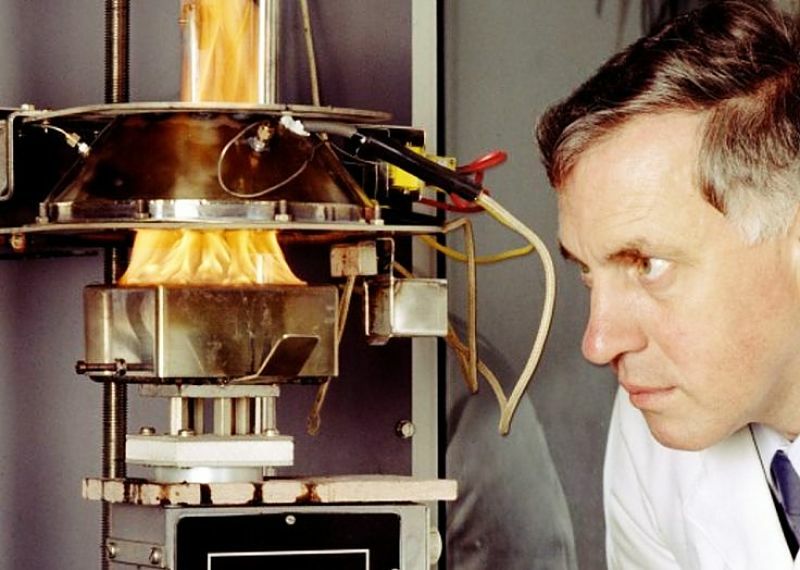 Wilbur Atwater, an agricultural scientist, invented the calorimeter method, which involves burning a weighed portion of food in the 'bomb' calorimeter and determining how much heat is released. The heat generated is absorbed by water. One calorie is the amount of energy needed to raise the temperature of one gram of water by one degree Celsius. Just to confuse things, calories on labels are generally expressed a kilocalories (1,000 calories) and written as 'Calories' with a capital 'C'. However, there are problems with this simplistic method for determining the energy delivered to the body when food is ingested. The effective calories, that is the calories delivered to a person when the food is consumed, may be over-estimated by 25%. This is very important for people who count calories as part of a weight control or weight-loss program, especially those on low-calorie, high-protein diets. This article highlights this inflated calorie problem, the foods to which it applies, why it occurs and the consequences for people on diets counting calories. 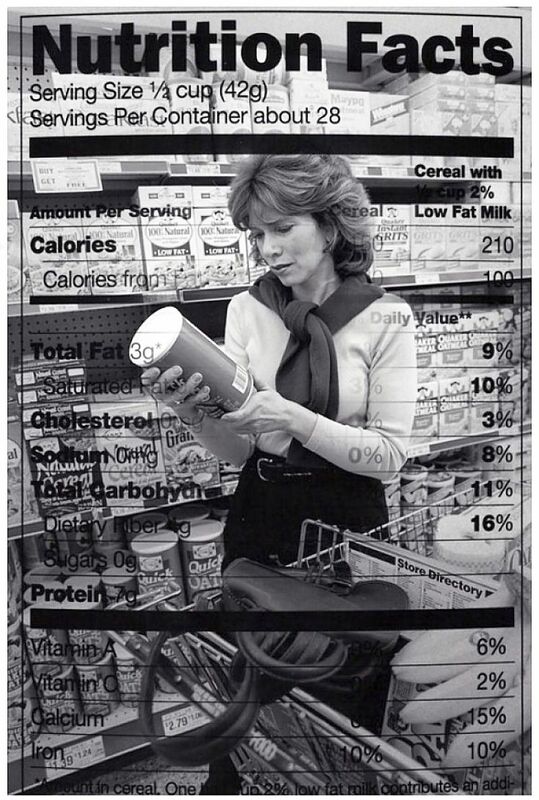 Why are Calorie Values on Food Labels Inaccurate? ► The process of chewing and digesting food consumes energy, so that the net calorie benefit is reduced. This notion has been expanded to claims that there are negative calorie foods, essentially foods which require more energy to digest than they contain. These claims are made for high-fiber, low calorie foods such as celery. While this is a myth, it is true that the net calories yield of many high fiber foods is less than would be expected from burning these foods in a calorimeter. Protein, fats and fiber are harder to digest than carbohydrates and sugars. This means that calorie counts for sugars and carbohydrates, and foods that consist mostly of these substances will be more accurate. Foods that take more energy to process will yield fewer calories than is released when the food is burnt. ► Some foods passed right through the gut undigested because our guts cannot process them at all. This applies to indigestible substances such as fiber and cellulose in the cell walls of plants, which are never completely digested and assimilated through the intestine. However, these substances do burn very well in a calorimeter. Cells enclosed in cellulose may not be opened up in time during the passage of the food through the gut. So the calories contained in these cells may not be available to the body. ► Some food items and portions may get bound up in fiber and plant matter, and may only be partially digested during the passage of a large meal through the gut. Protein is slow to digest and if the meal contains a lot of fiber from vegetables, some of the calories in the protein will not be realised because some particles of protein may pass out of the gut without being digested. This applies for indigestible fiber and bulk vegetable materials that can lock away bits of protein and fat in pockets, shielding it from being digested. But it can also apply to bulky foods or meals containing a lot of vegetable matter. The bulk of food consumed may stop complete digestion of the food. Significant parts of the food eaten may be excreted before all of the calories in the food gets into the body. ► Nuts are hard to digest and can pass through the gut without being properly digested. For example, almonds listed as containing 160 calories per serve, may only yield 120 calories due to incomplete digestion. ► The notion that the calories produced from different food types, such as proteins and fats versus carbohydrates, are different is also a myth. Calories are calories, no matter what the sources. All calories are equal, irrespective of the sources. The truth of this is clear when you understand the simple way that calories are measured. It is a simple combustion process. ► People on high-protein, high-fat and high-fiber diets should be aware that the calories they count for the food they eat may be inflated by as much as 25%. An adult setting a target of 1,500 or 2,000 calories a day on a high-protein, low-carbohydrate diet may actually be effectively consuming 400 to 500 calories less. 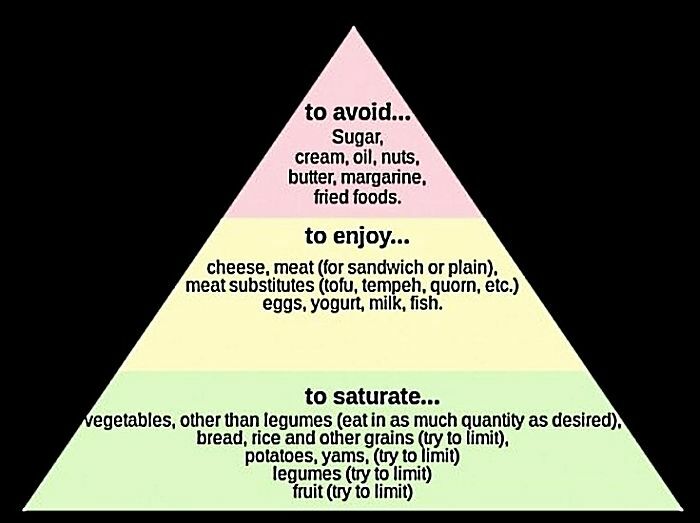 This is important for people wanting to go on very low calorie diets. They may go below the threshold of what is considered a safe minimum number of calories. ► Calorie estimates for junk foods, particularly those rich in processed carbohydrates, will be are more accurate. The exception may be meals that contain a lot of salad and high fiber foods which may only be partially digested. ► Some manufacturers and health authorities are considering making changes to calorie counts on labels to account for the inflated estimates for some foods. The push towards 'traffic light' labels and other integrated healthy food rankings makes this very important. Nuts and high-protein foods may be assigned to a less favorable health category, due to the inflated calorie estimates for these foods. ► Efforts to adjust the labels for nuts and other food have been proposed, but this would require major changes to regulations, the way calories are measured and advertising campaigns to inform the public on why the changes were necessary. It is also unclear how to deal with the variation in calorie yield associated with the circumstances in which the food is eaten. For example, a piece of beef steak eaten with a large serving of leafy and fibrous vegetables may have impeded digestion compared with eating steak by itself or with more easily digested foods such as potatoes and carrots. Similar issues apply for foods containing a wide range of ingredients. ► There are proposals to develop alternate and more accurate calorie counting systems for foods and ingredients. Such new methods would only count the number of calories that the body gets from food when it is digested. Additional calculations are made to consider the energy expended by the body in digestion, and the degree to which the food is processed. Such new methods are being developed, but they are expensive. ► For most foods the calorie labelling system is OK, so it is probably sufficient to inform people of the foods and ingredient combinations for which calorie counts may be inaccurate. The table below shows the reduction in calories associated with the inaccuracies in estimating calorie yield from foods. Food that contain protein and fiber are the one mostly affected. Meat, fish, seafood and nuts show the largest reductions. Greek yogurt has substantial protein and so it has less actual calories than the number stated. High carbohydrate foods such as fruit juice and rice show no change. Calories are measured using a calorimeter that records the amount of heat released when food is burnt and the change in temperature of a water surrounding the calorimeter. 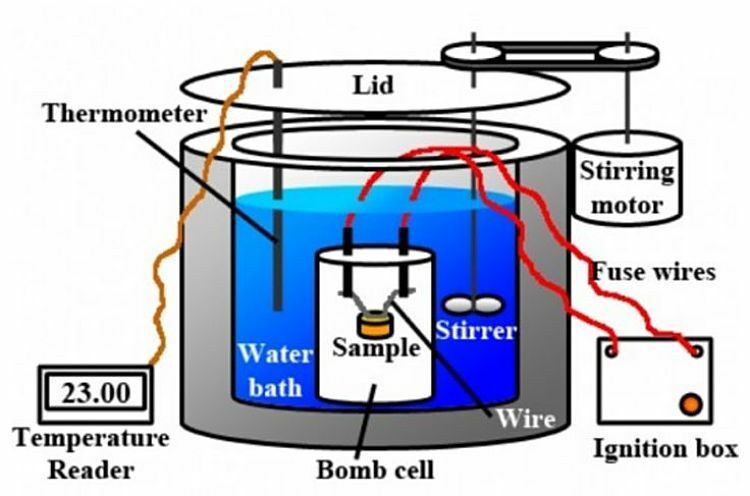 The elements of a calorimeter which is used to measure calories in food and ingredients. One calorie is the amount of energy needed to raise the temperature of one gram of water by one degree Celsius. 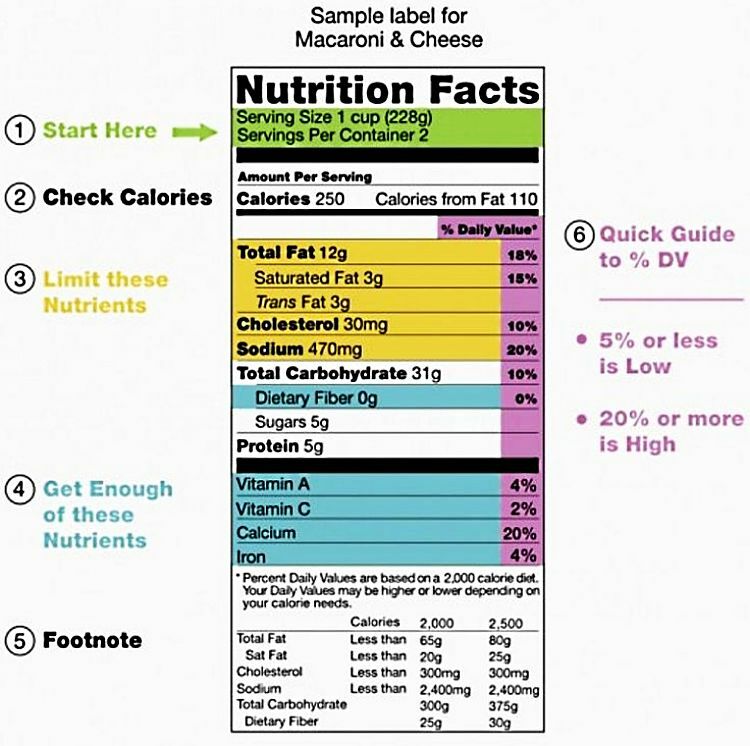 The calories on food labels may not be accurate for some foods such as proteins, high-fiber foods, nuts and bulky leafy vegetables. Advice regarding food choices may be wrong if the calorie counts for foods and ingredients are inaccurate. Learn why they may be wrong in this article.